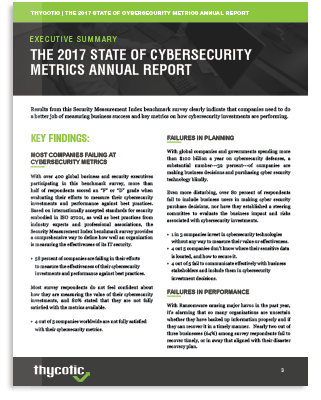 58% of survey respondents scored a failing grade in measuring the effectiveness of their cybersecurity investments and performance. 4 out of 5 companies worldwide are not fully satisfied with their cybersecurity metrics. 1 in 3 companies invest in cybersecurity without any way to measure its value. 4 out of 5 companies fail to include business stakeholders in cybersecurity investment decisions. 4 out 5 companies don’t know where their sensitive data is located, and how to secure it. 58% scored a failing grade in measuring effectiveness of cybersecurity investments and performance. Want the full report? Fill out the form at the top of this page. The 2017 Security Measurement Index Report provides several recommended actions to help secure your enterprise and gain a better understanding of the effectiveness of your cybersecurity spend. Results of the survey clearly indicate that cyber security metrics must become much more of a priority. Yet too many organizations still make security decisions blindly without clear measurements about the impact on their cyber security posture, protecting sensitive data, and ensuring the business can recover efficiently from a breach. Backup critical data and systems and customize your recovery plan for different types of cyber threats. Test your restore capabilities. As government seeks to improve intra-agency and inter-agency collaboration, government agencies and offices are making a concerted effort to improve the efficiency and effectiveness of their cyber security to combat emerging threats though greater compliance with FISMA requirements and NIST SP 800-53 controls. Better management of privileged accounts and their elevated access has become a key component of federal government cyber security standards. These standards include ISO 27001 and NIST SP 800-53, Rev. 4 requirements that cover Access Control, Audit and Accountability, and Identification and Authentication control families. Thycotic Privilege Manager for Windows and Mac protects endpoints from malware and enforce least privilege policies to shield applications and systems from malicious access.